It’s kind of embarrassing to think of all the mistakes I made when I was a new coach just starting my coaching business. One of the biggies is that I focused on selling coaching instead of selling a solution. I had just completed my coach training, was enamored with the transformational power of coaching and talked about it non-stop. The problem is, most people aren’t specifically looking for coaching, so all of my excitement about coaching was falling on deaf ears. Get your seat in the training class now! The BIG Mindset Shift you need to make if you‘re serious about maximizing the sustainability and profitability of your coaching business. 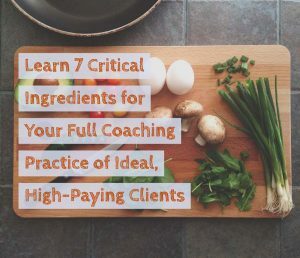 How to package and price your coaching to attract more clients and increase your profits. The secret for enjoying a steady stream of potential clients who want what your coaching provides. The #1 Reason Why Coaches Fail to fill their practice and achieve success, and what you can do to avoid this huge pitfall. You‘re invited to attend at no charge as a Thank You for being part of my community! Click here and let’s get your coaching business on track. I look forward to “seeing” you there.